An exotic and free-flowering horticultural cultivar with trumpet-shaped flowers. 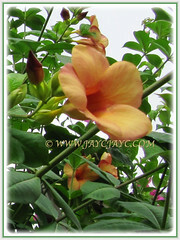 Ornamental tropical climbing shrub that display masses of peach-coloured and trumpet-shaped flowers all year round. Beautiful when trained with the support of a trellis or tree. Etymology: The genes name, Allamanda is in honour of Swiss botanist and physician Frederic-Louis Allamand. The specific epithet, cathartica means purgative. Origin: Native to tropical Central and South America. It is also cultivated worldwide, especially in the tropical regions. 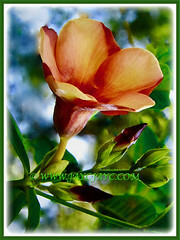 Nevertheless, Allamanda cathartica cv. Indonesia Sunset is a horticultural cultivar. 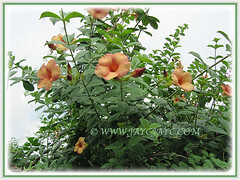 Plant type: An ornamental perennial climber or shrub. 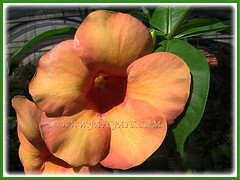 Features: Allamanda cathartica is a species of the genus Allamanda that consists of about 12 to 15 species of flowering plants. A fast growing perennial shrub that reaches about 3 to 6 m and spread to 0.9 to 1.8 m wide. It produces simple, evergreen and leathery leaves that are elliptic with wavy leaf margin. They are arranged in whorls of 3-4 or in pairs along the stems. Stem is woody and reddish to purplish in colour. Large apricot and peach-coloured flowers are trumpet-shaped. The flower has 5 lobed sepals and a funnel-shaped corolla of five petals. They occur in small clusters, axillary located along the stems. Each flower is about 9 cm long. The flower will eventually be followed by prickly seed pods that release two to four winged seeds. 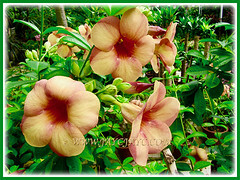 Culture (Care): Allamanda cathartica cv. Indonesia Sunset can be easily grown with minimum care. Light: Best in full sun or semi-shade. Moisture: Moderate water requirements. Do not keep the soil waterlogged. Soil: Best in humus-enriched, well drained soils. However, any commercial soils with good drainage is fine too. Others: Best to prune it regularly to prevent the vine from growing too tall. This will help to maintain it into a shrub form, otherwise it can sprawl to6.1 m in height. It flowers best in full sun. Please be aware that all parts of the plant are poisonous and if cut, the foliages oozes white latex that can irritate the skin. Allamanda cathartica is considered an invasive species in Queensland. Generally free from serious disease or insect. However, do watch out for mealybugs and leaf spot. For subtropical and temperate regions: Hardiness: USDA Zone 10 to 11. Best performance occurs in hot and humid climates where nighttime temperature do not dip below 15.5°C. 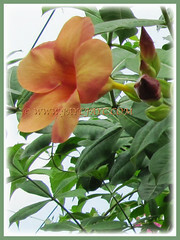 Advisable to grow Allamanda cathartica cv. Indonesia Sunset as an annual, in a container or in the greenhouse. It is frost tender. Container plants must be brought inside before first frost and overwintered as houseplants in large sunny rooms with intense bright light and moderate humidity. When grown as a vine, it must be trained to grow on a support structure because it does not twine or have tendrils/aerial roots. May also be pruned to grow as a shrub. Thin stems to promote air circulation if fungal diseases attack the foliage. It will bloom throughout the summer to first frost. 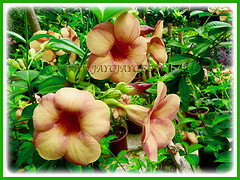 Usage: Plant Allamanda cathartica cv. 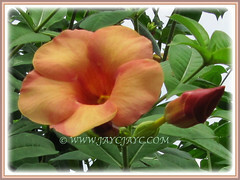 IndonesiaSunset for its large ornamental flowers. Ideal to be grown in parks and small gardens or as a hedge and screening. A vine that is suitable to be grown on the ground. Ideal too for container planting. Plant this gorgeous shrub with peach-coloured showy flowers for porches, trellises, and fences. Excellent to be used as a landscape shrub too. 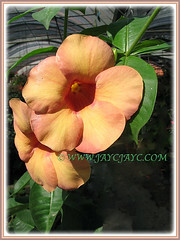 Allamanda cathartica with anti-fungal properties has been used to treat liver tumours, jaundice and malaria in some regions.